Einn af leiðandi víbrafónleikurum Evrópu, Pascal Schumacher frá Luxembourg leiðir kvartett sinn “Left Tokyo Right” á Jazzhátíð fimmtudaginn 11. ágúst. Pascal leitast við að fella saman tónlistarstíla í eina heillandi heild þar sem spuni og hugvit skapa hljóðheim sem er jafnt framsýnn sem lagrænn. Með honum leika Franz Von Chossy (p), Poi Belardi (b) og Jens Düppe (d). Sérstakur fókus verður á víbrafóninn á Jazzhátíð í ár, en Stefan Bauer frá Þýskalandi er einnig væntanlegur til landsins. 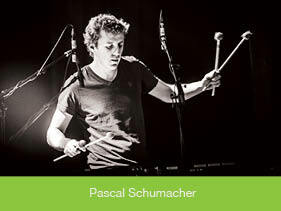 One of Europe’s leading vibraphonists, Pascal Schumacher, hails from Luxembourg. Schumacher has been relentless in assuring his position as a boundary-pushing musician. Keen to explore the links that exist between many musical genres, he plays the vibraphone with a unique flair for improvisation and a lucid inventiveness which together creates an original sound as visionary as it is melodic. He brings his quartet “Left Tokyo Right” with Franz Von Chossy (p), Poi Belardi (b) and Jens Düppe (d).